The document calls for Catalonia to be recognised as an "independent and sovereign state". A 1 October referendum in the north-eastern province - which Catalan leaders say resulted in a Yes vote for independence - was declared invalid by Spain's Constitutional Court. 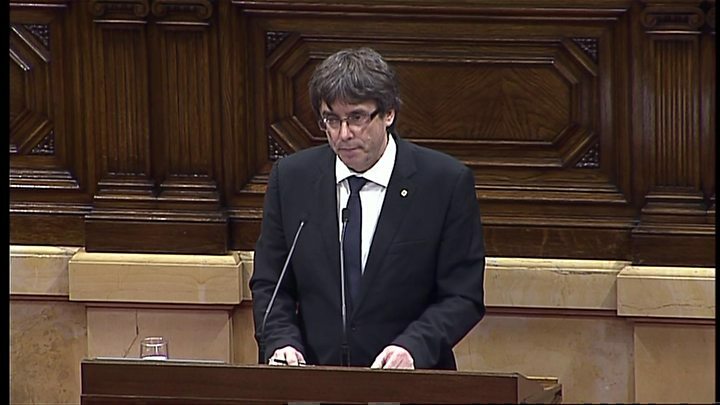 Earlier on Tuesday, Mr Puigdemont told the Catalan parliament in Barcelona that the region had won the right to be independent as a result of the vote. Catalonia crisis: What are the options now? The referendum resulted in almost 90% of voters backing independence, Catalan officials say. But anti-independence voters largely boycotted the ballot - which had a reported turnout of 43% - and there were several reports of irregularities. The declaration reads: "We call on all states and international organisations to recognise the Catalan republic as an independent and sovereign state. Mr Puigdemont told the regional parliament that the "people's will" was to break away from Madrid, but he also said he wanted to "de-escalate" the tension around the issue. "We are all part of the same community and we need to go forward together. The only way forward is democracy and peace," he told deputies. 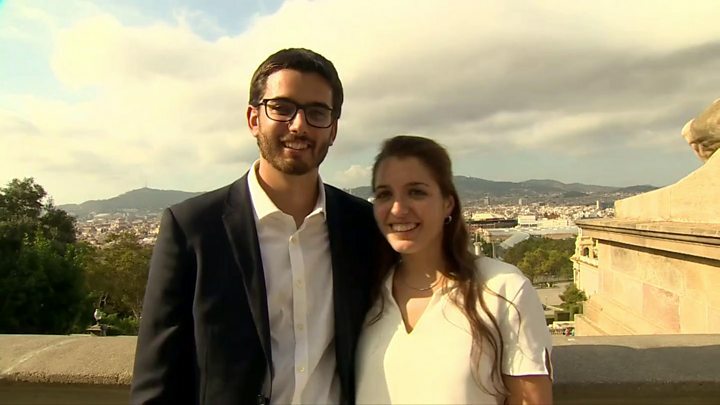 But he also said Catalonia was being denied the right to self-determination, and paying too much in taxes to the central government in Madrid. Spain's Deputy Prime Minister Soraya Saenz de Santamaria responded to Tuesday's developments by saying: "Neither Mr Puigdemont nor anybody else can claim... to impose mediation. "Any dialogue between democrats has to take place within the law." She added: "After having come so far, and taken Catalonia to the greatest level of tension in its history, President Puigdemont has now subjected his autonomous region to its greatest level of uncertainty. Spanish Prime Minister Mariano Rajoy has called an extraordinary cabinet meeting for Wednesday morning to address the latest moves in the crisis. As Catalonia's leader announced he would declare independence, thousands of his supporters, watching his speech nearby, on a big screen, were euphoric. But seconds later - when Carles Puigdemont qualified his announcement - and said the declaration would be suspended for several weeks, the disappointment was visible in the crowd. Mr Puigdemont's language was stark, claiming that he had to follow the will of the Catalan people. But he is playing for time - offering a window for the possibility of dialogue with Madrid. His ultimate aim, to pressure the Spanish government to allow a legitimate referendum, remains. But it's highly unlikely that the Spanish government will accept that and there are signals now that its patience is wearing thin. Catalonia's centre-right, centre-left coalition government only had a majority of MPs in the regional parliament with the support of another small pro-independence party, on the far left. That party is unhappy that there has been no clear declaration of independence. And so Catalonia's awkward coalition of pro-independence parties feels more fragile. Independence supporters had been sharing the Catalan hashtag #10ODeclaració (10 October Declaration) on Twitter, amid expectations that Mr Puigdemont would ask parliament to declare independence on the basis of the referendum law it passed last month. But influential figures including Barcelona's mayor Ada Colau and European Council President Donald Tusk had urged Mr Puigdemont to step back from declaring independence. 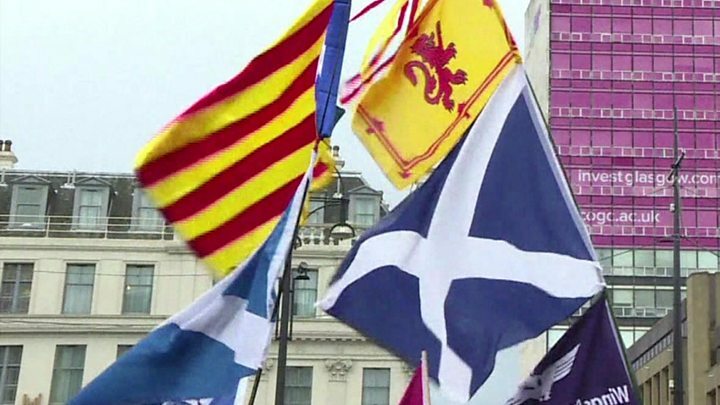 Media captionWhat do Scottish nationalists think about Catalonia? Catalonia, a part of the Spanish state for centuries but with its own distinct language and culture, enjoys broad autonomy under the Spanish constitution. However, a 2005 amendment redefining the region as a "nation", boosting the status of the Catalan language and increasing local control over taxes and the judiciary, was reversed by the Constitutional Court in 2010. Catalonia is is one of Spain's wealthiest regions, accounting for a quarter of the country's exports. But a stream of companies have announced plans to move their head offices out of Catalonia in response to the crisis. Are you in the region? E-mail us at haveyoursay@bbc.co.ukwith your stories.